We depart for Canyon de Chelly, another sacred Navajo area. This, one, however is a national park. 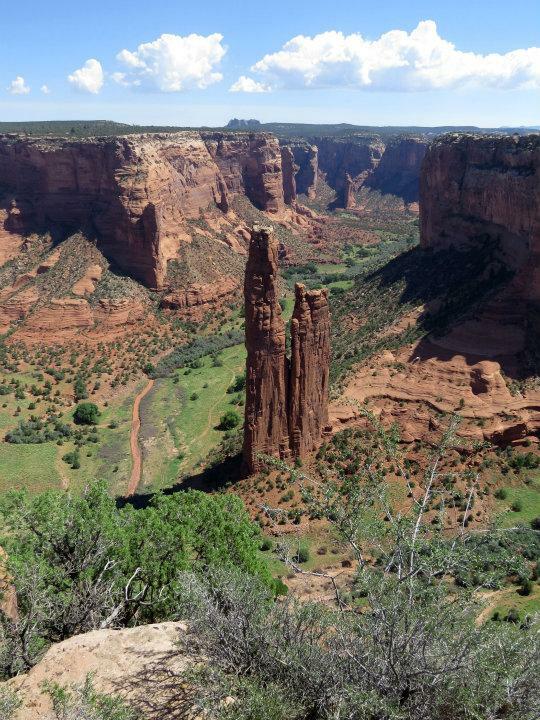 Canyon de Chelly is a wonderful mix. It is a protected canyon with only one way to get in so people have taken shelter here for some 5000 years. You can see much of it from the 30 mile round trip tours of its rims. Or, you can hire a guide who will take you to see the cliff dwellings, the petroglyphs and hear a recap of the massacre of most of the residents by the Spanish army in 1805. Since this our third site covering similar periods of native history, we were familiar with much of what our guide related. However, the tour got much more interesting as she talked about growing up in the canyon. People still live here, plant corn in the summer and tend their cattle and sheep. More tradition based than economically viable. She also detailed the story of the massacre, recounting the lone survivor's recap in Navajo, before translating into English. It was very moving. We repeated our noon day tour of the south rim at sunset with its view of Spider Rock. Cows are grazing by the side of the road. There is a new Holiday Inn Express right outside the entrance but we opted for Sacred Canyon Lodge, old, but far more interesting as the local residents drift in for a meal at the cafeteria. Like Monument Alley, no electricity or running water in the Canyon itself, so the motel is sort of a local gathering spot. We stopped at Hubble's Trading Post on our way south to the Painted Desert. This, too, is part of the US parks system. We are still trying to sort out what the different categories are, a park versus a national landmark versus an historical site, etc. The trading post looks pretty much like it did when it was built 150 years ago. And the area Navajo still bring their items here to sell and a visitor can purchase a can of soup or a soda. A neat experience.